1 of 1 Break crackers into food processor. Pulse until finely crumbed (1-1/2 cups). Combine crumbs and butter in bowl. Press over bottom and up sides of 9-inch pie plate. Chill while preparing filling. 1 of 2 Prepare whipped topping mix following package directions, using nonfat milk and vanilla. 2 of 2 Dissolve coffee in hot water in small bowl. Stir in yogurt and 1/3 cup chocolate syrup. Fold yogurt mixture into whipped topping. Pour mixture into prepared piecrust. Cover and freeze overnight. Before serving, place pie in the refrigerator for 15 minutes. 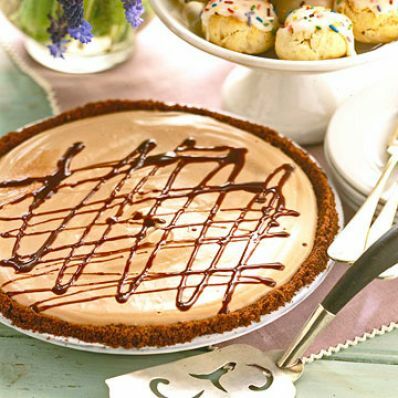 To serve, drizzle with remaining chocolate syrup. Makes 8 servings.